Being a stay-at-home parent is a full-time job. Unfortunately, it doesn't come with a full-time paycheck. As a result, it can be hard for some families relying on just one income to make ends meet or build savings. 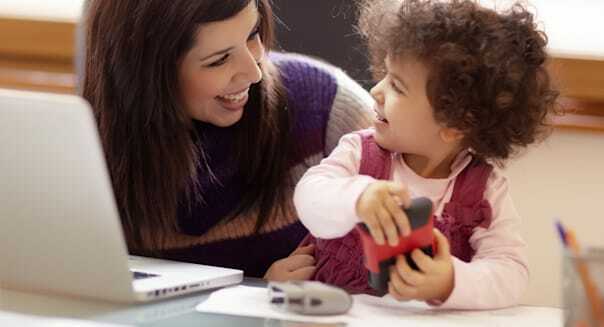 However, there are ways for stay-at-home moms and dads to earn a bit of extra cash to supplement the family budget without leaving the house or sacrificing time with the kids. In fact, here are 10 money-making opportunities that can be pursued when your children are at school or asleep, or possibly even when they are awake and demanding your attention. The earnings potential is modest, and not every opportunity will be right for you, but over the course of a year you could pocket hundreds -- and possibly even thousands -- of dollars. Taking surveys online can be a relatively quick way to earn enough to afford a few extras. Harris Poll Online, for example, awards points for the completion of online surveys, which can take between five and 25 minutes to fill out. Survey takers accumulate points and can redeem them for gift cards from retailers such as Amazon and Starbucks. Harris Poll Online also runs sweepstakes for survey participants that pay out cash rewards to winners. The top prize is $10,000. Other online outfits that will pay you to take surveys include SurveyClub, Global Test Market and Swagbucks. There's no cost to sign up. Another way to make extra cash in a short amount time -- $10 for about 20 minutes of work -- is to sign on with UserTesting and evaluate Web sites. You need a computer with a microphone and Internet connection, and you'll have to fill out a one-page demographic profile. You'll receive work if your profile matches that of the target audience of sites being tested. Then it's just a matter of using UserTesting's screen recorder, which you'll need to download to your computer, to record your verbal comments and on-screen movements as you click through a site. Site owners typically are looking for feedback about whether the Web site is confusing to navigate. Some attorneys use large panels of online mock jurors to get feedback on their cases before they go to trial. However, the mock jurors must live in the county or federal district where the case will be tried. You can sign up at a couple of sites and receive e-mail notifications if a case is posted in your area. EJury.com pays $5 to $10 per case via the online payment system PayPal. You can't be an attorney, paralegal or legal assistant -- or even related to an attorney -- to participate. EJury says you're likely to have better luck getting picked if you live in a large metropolitan area, where more cases are tried, rather than a rural area. The average case takes about 35 minutes to review. At OnlineVerdict.com, where cases typically take between 20 minutes and one hour to review, fees range from $20 to $60. Payment is made by check. If you have a computer with Internet connection and are good at searching the Web and communicating with others, you can become a virtual personal assistant with Fancy Hands. The service hires assistants, who set their own hours, to help its users tackle tasks such as making calls to service providers, scheduling appointments, and finding the best prices for services and products. You get paid per task, starting at between $2.50 and $7. If you have an academic specialty and can squeeze in a couple of hours during the week while Junior is taking a nap or Janie is at gymnastics, share your knowledge with struggling students. Find students looking to improve their grades on your own through your kids' schools -- check a site such as Craigslist.org to gauge hourly rates in your area -- or sign on with an online tutoring company, such as Tutor.com. You must be available to tutor at least five hours a week and have a college degree to tutor certain subjects for Tutor.com. Tutoring is done virtually from home via a computer, not in person. Tutor.com tutors are paid an hourly rate based on the subject. If you haven't used your free time between changing diapers, washing clothes and shuttling kids around to hop on the blog bandwagon, it's worth considering this potential source of income. And just because you're a parent doesn't mean you have to write about parenting issues. In fact, given that there already are so many blogs about life as a mom (or dad), consider writing about another topic about which you are passionate. The more original, entertaining and informative you are, the more likely you'll gain followers -- and you need an online following to make money. You can create your blog using a free platform from WordPress.org, but you'll need to pay a small amount – as little as $4 per month -- to have your blog hosted. Try GoDaddy.com, which can provide a domain name for your site, email addresses, database storage and other Web hosting services. To make money, you can use the free Google AdSense service to display advertisements on your site. The amount you're paid varies by ad and usually depends on how many people see it. There's also what's called affiliate marketing, in which you earn a commission (usually less than 10 percent) whenever someone clicks on an ad on your site and purchases a product. The Amazon Associates affiliate program allows you to advertise the retailer's products on your site, or try affiliate networks such as CJ Affiliate or ShareASale that work with thousands of companies. Depending on how much time you put into your blog and how many people visit it, you could be making a few hundred dollars each month within a year. Maybe you don't want the commitment of a blog but like to write or express your creativity. You're in luck because plenty of media, corporate and nonprofit Web sites are looking for freelancers to write, edit or produce content. Some pay by word, some by the hour and some pay per project. For example, if you register for free with Textbroker.com and submit a writing sample, you'll receive a rating based on your content quality. Then you can choose which projects you want based on your quality rating and earn 0.7 cent to 5 cents per word, or more. FreelanceWriting.com provides a long list of freelance writing opportunities culled from several top sites. Many of the recent listings offered hourly rates of $25 or more. For $21 a month, you can join Mediabistro's freelance marketplace to post your qualifications for review by media managers seeking writers. If you're skilled with a camera, you can turn your photos into cash by selling them to stock image sites, such as Shutterstock.com. If the photos you submit are accepted, they can be downloaded by Shutterstock's subscribers and you can earn anywhere from 25 cents to $120 per image download. Other sites that accept photos from contributors include iStock, Dreamstime and Sqeeqee. Working parents might not have the time to whip up a birthday cake or cupcakes for school parties. That's where you come in if you can create tasty baked goods. A friend of mine who is a single mom started making cupcakes as a way to keep herself occupied while staying with her dad when he was undergoing chemotherapy. She posted a picture of her cupcakes on Facebook and instantly received several orders from friends. Now she makes about $200 a month making cupcakes for others who hear about her through word of mouth or see pictures of her cupcakes on her Facebook page. There's a good chance your friends who work outside of their homes would be thrilled to have an experienced parent watch their children while they are at the office. It can be manageable if your friend in need has only one or two kids. Plus, the new playmates will help keep your children occupied for a few hours. Pay varies widely based on where you live and the ages and number of kids you'll be watching, but babysitters and nannies typically can make up to $10 an hour in small cities and much more -- even double that hourly rate -- in larger cities.